In the early morning hours of September 19, 2011 (3:40 am), Philadelphia boxing icon George Benton died at St. Joseph’s Hospital in North Philly, after battling pneumonia for the past few weeks. He was 78. Benton was one of the most skilled boxers in Philadelphia’s storied boxing history. He fought and beat many of the best of the ring. He was a scientist between the ropes who could outthink them all - at least those willing to step in there with him. But he was avoided by many. When he was a fighter, he could avoid just about every punch that came his way. He never ran; he just stood there, twisting and turning the fraction of an inch needed to stay untouched. He did his best to stay out of harm’s way. I’m not sure if it was mathematics, geometry or something else, but his method worked. His theory on getting hit was simple - don’t let it happen. But he couldn’t dodge every bullet. His long career ended in 1970 after a shot from a gun - intended for someone else - entered his back and forced his retirement after 21 frustrating years in the boxing ring. He left the fight game as a great boxer who never really got his due. But that was just the beginning for George Benton. After two years in and out of the hospital and a long recuperation from the gunshot, Benton returned to the boxing world. He was back in the gyms, and back in the corners, but not as a fighter. Instead George Benton became a boxing trainer. His lifetime of boxing knowledge would not go to waste. The rest was history. It couldn’t have been a better fit. 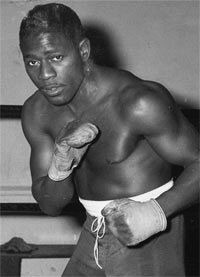 No one knew more about boxing than Georgie Benton. Everyone agreed with that. But what they didn’t understand was that Benton could also become a teacher. A great one. He had the ability to impart to others all the hard lessons he had learned during his career, as well as old-school basics and scientific touches of boxing. He knew and preached the things it seemed fighters no longer did - the angles, the movement, and not getting hit. To Benton these were instinct and they were gospel. They called him the Professor, the Master, the Mayor. He had a lot of nicknames. But they all meant the same thing - Benton was the boss, the expert, the one who knew it all. For years and years, Benton worked the corners of countless young - and not so young - fighters. His first assignment as a trainer was with old foe and fellow North Philly icon Bennie Briscoe. Imagine them together and on the same team. Bad Bennie was an old dog who had already been in the boxing ring for a lifetime. So Benton merely fine-tuned the rugged puncher and helped to extend his career several more years. Eventually Benton would become the trainer for a legendary list of boxers. Pernell Whitaker, Meldrick Taylor, Evander Holyfield, Johnny Bumphus, Leon Spinks, Rocky Lockridge, Joe Frazier, Tyrell Biggs, Tex Cobb, Curtis Parker, Earl Hargrove, and many others all called him their trainer. As a fighter, Benton became the top middleweight contender but was never given a chance to win a world title. However as a trainer, he won title after title, and won defense after defense. He was widely regarded as the best trainer of his day. “This is how I won the championship”, he once told me. Having George in your corner didn’t guarantee you a title, but it didn’t hurt. Benton was named the “Trainer of the Year” in 1989 & 1990 by the Boxing Writers Association. He was inducted to the International Boxing Hall of Fame in 2001, the Pennsylvania Boxing Hall of Fame in 1986, and the World Boxing Hall of Fame in 2007. As a boy, his life in boxing began by hanging out at the Johnny Madison Gym in North Philly. He and a few friends would peer into the gym, fascinated by the fighters and all the action inside. Johnny Madison would shoo them away every day, but Benton kept coming back. He couldn’t be shooed. Eventually “he gave me a broom”, Benton once said of gym-owner Madison. Benton swept the gym and did whatever was asked of him. After a while, Madison gave him a pair of trunks, and young George was training and learning the finer points of the sport. As an amateur boxer, Benton won the Philadelphia Golden Gloves in 1947 as a 126-pounder, and placed second the following year as a welterweight. In 1949, Benton won the welterweight Mid-Atlantic AAU / Diamond Belt. Benton turned professional on July 18, 1949 with a first round KO of Chico Wade at Toppi Stadium in South Philly, and went on to post an overall pro record of 61-13-1 with 36 KOs, through 1970. He beat Joey Giardello, Jimmy Ellis, Freddie Little, Jesse Smith, Johnny Morris, Slim Jim Robinson, Bobby Jones, Chuck Goldsby, Holly Mims, Jetson Arnold, and others. He was trained by Joe Rose and managed by Herman Diamond throughout most of his career. In 1961, Benton’s third round knockout of Chico Corsey opened the Blue Horizon, that legendary North Philly fight club that died last year. His accomplishments and contributions to the sport of boxing can never be tallied. He was without question one of the true legends of the sport - inside Philadelphia and out. Within the last year, old-school trainers Jimmy Arthur and Bouie Fisher also passed away. It seems that all the great corner kings are gone now. Time produces a slow epidemic of loss. With the passing of George Benton, it is fair to say that Philadelphia has lost its greatest boxing trainer ever. That fraternity is an elite group, filled with the greatest boxing minds who ever lived. As great as the others were, Benton was the Professor and the Master of them all. He is survived by his wife Mildred and a large family of children, grandchildren, great-grandchildren, extended family, many friends and millions of boxing fans. Many say that boxing is dead. Although I will never believe that, after the death of George Benton today - just nine months after the passing of Bennie Briscoe, that claim feels like it holds some truth. But it won’t last. In time the memories of Benton, Briscoe and all the other greats of the past always rise up to keep boxing afloat in the minds and hearts of those of us who love the sport. We love boxing because of men like George Benton. We owe these men everything. Thank you Georgie. Rest in Peace.